Gravel is used for a wide range of purposes, from roads to driveways and more. This crushed stone comes in a wide range of sizes. So how much does a yard of gravel weigh? The weight of gravel depends on the type and density or grading. In most cases, a cubic yard of gravel weighs between 2,400 to 2,900 pounds (1,088 to 1,315 kg). How Much Does A Yard Of Pea Gravel Weigh? A cubic yard of pea gravel weighs between 2,500 to 2,600 pounds (1,133 to 1,179 kg). How Much Does A 5 Gallon Bucket of Gravel Weigh? A 5-gallon bucket of gravel weighs 70 pounds (31.75 kg). That’s much heavier than a 5-gallon bucket of water that weighs in at 41 pounds (18.59 kg). Different grades are also available, depending on what it will be used for. Crushed stone #1 which includes 2-inch to 4-inch stone. Crushed stone #3 which includes ½-inch to 2-inch stone. Crushed stone #5 which includes 1 inch to fine stone particles. Crushed stone #10 which is stone dust. Crushed stone #57 which includes ¾-inch stone. 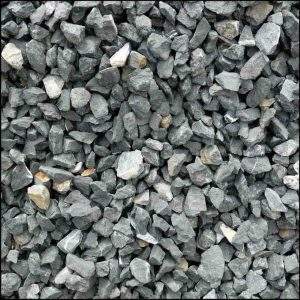 Crushed stone #67 which includes ¾-inch stone down as far as fine stone particles. Crushed stone #411 which includes stone dust and ¾-inch stone. Temperature and weather has a lot to do with the popularity of gravel in construction and especially when it comes to road building. For hundreds of years, most roadways were little more than dirt tracks. This meant that these roads would get washed away when it rained or when snow and ice thawed. However, gravel is much better for drainage and is not affected as badly by adverse weather conditions.